A Kwara-based grassroots group, Kwarans Act Now (KAN), has challenged Senate President Bukola Saraki to make his response to the Police over his alleged involvement in the Offa robbery public. The group said this in a press statement on Friday to react to the newly arrested suspects of the Offa robbery. 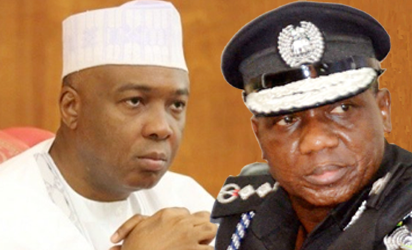 It will be recalled that the Police is probing allegations made against Senate President Bukola Saraki by suspects arrested over the April 5 Offa bank robbery in which no fewer than 33 persons were killed. The police had initially invited Saraki for interrogation before soft-pedaling to request for only a written explanation within 48 hours. Also linked to the bloody robbery incident in which nine policemen were killed was Gov. Abdulfatah Ahmed of Kwara following alleged claims by the suspects that they were political thugs working for the duo. But the Senate president and Ahmed had both dismissed the allegations as an attempt to frame them, adding that he already responded to the Police in writing. But the KAN faulted the Senate President for not making his response public, noting that the public deserves to hear his side of the story for the sake of transparency. The statement read: “We are of the view that since the Police invitation and statements of the suspects were made public, the Senate president should also make his response public. This will give room for transparency. It will also make members of the public aware of the original statements made by the Senate President. We do not want a situation which a party will be alleging witch-hunt or distortion of message. “Our politicians, regardless of the situation they occupy, must know that they are responsible to the people. It is unfair for any of them to be playing on the intelligence of Nigerians. You cannot run to the public that you are being witch-hunted, the public reacted, and evidence was tendered and made public, then suddenly you go private. No, we will not accept this.